Figure 01: Pylos Combat Agate. Wikimedia commons. David Mathisen, in this original analysis of the Pylos Combat Agate, offers a stunning glimpse of “the great world-wide archaic construction” described in De Santillana and Von Dechend’s Hamlet’s Mill. Experts are already debating the meaning of the scene, in which a triumphant warrior plunges a sword into a heavily-shielded combatant wearing a crested helmet, while another lies sprawled-out beneath their feet, apparently dead. Unnoticed until now, however, is that the scene details a pattern in the heavens. For the figures contain details specific to the constellations Hercules, Ophiucus, Corona Borealis, Scorpio and Sagittarius—using constellational references and artistic conventions that can be found in other ancient works of art from other cultures around the globe, and which also continue to appear in sacred art spanning thousands of years. Indeed, building upon the hints offered in Hamlet’s Mill, I have found evidence in both ancient myth and ancient artwork that clearly demonstrates that ancient myths, scriptures and sacred stories from around the globe—including ancient artwork depicting mythical scenes—are frequently based on celestial metaphor, as part of a system that appears to have been mature before the earliest tablets of the Gilgamesh cycle or the stone walls containing the Pyramid Texts were inscribed. This suggests the existence of some even earlier culture or civilisation, upending conventional timelines of early human history. The scholars who led the team that discovered the tomb, Sharon R. (Shari) Stocker and Jack L. Davis, have speculated that the scene may reflect a scene from a myth or legend well-known to the Minoan and Mycenaean cultures.iv They may be correct, but in addition to any mythological connections, the posture of the figures and specific details of their armour and ornamentation point to a celestial foundation for this groundbreaking piece of ancient artwork. In an article published by The Telegraph, Shari Stocker says, “This seal should be included in all forthcoming history texts, and will change the way that prehistoric art is viewed”.v I could not agree more—and will go further by suggesting that it should change the way that ancient human history is viewed as well. Below is a reproduction of the scene in which the major outlines of the figures have been coloured to help distinguish them (the original figures are not coloured in this way). Figure 02: Pylos Combat Agate, Wikimedia commons. Modified with colour by David Mathisen. The scene depicts a triumphant, long-haired warrior in an extreme lunge, stabbing downwards into a foe with a sword held in his right hand, his right arm raised over his own head. This figure, to whom I will refer as the Swordsman, has been tinted red in the diagram. The figure into whom the Swordsman is plunging his sword has a large shield, which appears to have been battered into a somewhat folded lozenge or diamond-shape, possibly by the prior combat. This figure’s right arm is extended straight back from his shoulder and holds a long spear, the point of which can be seen on the other side of the Swordsman, whom he is facing. I will refer to this second figure as the Spearman, and he is tinted blue. He is evidently about to receive a mortal wound from the Swordsman. Additionally, the Spearman wears a helmet with a prominent curving crest: the left arm of the Swordsman is extended towards this curve and the left hand of the Swordsman is grasping this curved crest of the Spearman’s helmet as the Swordsman delivers the downward sword-blow. Finally, there is a third figure stretched out below the two fighting figures of the Swordsman and the Spearman: this figure has apparently already been killed and his body is twisted into a contorted position even while stretched-out. He is tinted green in the diagram above and I will refer to him as the Fallen Warrior. His head is to the left as we look at the seal, and his lower (right) leg is fully extended to the right as we look at the scene. His left leg is sharply bent with the knee pointing upwards. His body is twisted so that his back is facing the viewer, and the detail of the musculature of his back is extremely skilfully rendered. His arms are splayed out at different angles, with one drooping down towards his legs and the other bent over his head, and the back of his hand against the ground. The details of this scene are strongly suggestive of the outlines of specific constellations in the night sky, and of constellations that appear to have formed the basis of other pieces of ancient artwork. Below is an image depicting the region of the night sky containing the constellations Hercules, Ophiucus, Corona Borealis (the Northern Crown), Sagittarius and Scorpio. The brightest part of the Milky Way galaxy can be seen to rise up from the horizon between the constellations of Sagittarius and Scorpio. In this image, the colour scheme has been inverted such that dark is light and light is dark, so that the background night sky, which ordinarily would be black, is light-coloured, and the stars are shown as black dots. The Milky Way, which would be a shining light in the actual night sky, appears here as dark-coloured clouds. 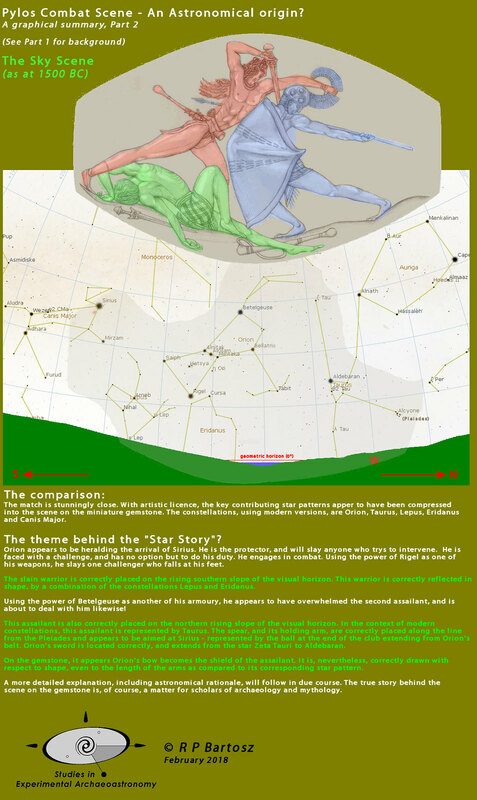 Figure 03: Pylos Combat Agate artwork (colorised) above star chart showing the region of Hercules, Ophiucus, Scorpio and Sagittarius. Note that the Hercules figure in the sky appears to be executing a deep lunge, with one arm raised above its head, brandishing a sword. The other arm reaches downwards, and is extended nearly straight-out from the body. The similarities to the figure of the Swordsman in the Pylos Combat Agate should be self-evident: that figure also has an extended rear leg, and the arm holding the sword arches over the head of the figure on the agate in much the same manner as the outline of Hercules in the sky. Alone, these similarities are not enough to make a conclusive argument, but as we will see from further investigation, the ancient artist has included other features that make the celestial identification extremely compelling. Immediately below Hercules in the sky we find the oblong, rectangular shape of the constellation Ophiucus, whose name derives from the Greek word for “serpent” and who is known as the Serpent-handler or Serpent-bearer. The figure of Ophiucus appears to be holding a serpent, which can be seen on either side of the tall, rectangular body of the celestial figure. Note that the constellation Ophiucus is located below the constellation Hercules, as seen in the sky of an observer in the northern hemisphere of our planet, such as ancient Greece, Mycenae, or Minoan Crete. This suggests that the constellation Hercules, brandishing a mighty sword, could be envisioned as striking (or preparing to strike) a mortal blow to the figure of Ophiucus. Indeed, other details suggest that the figure of the Spearman in the Pylos Combat Agate corresponds with the outline of Ophiucus in the night sky. Figure 04: Athena from Gigantomachy, Wikimedia commons. Figure 05: Star chart with Ophiucus shield-area colorized in blue. 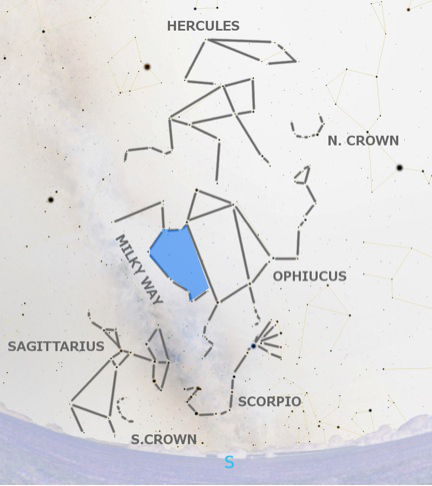 Figure 06: Star chart with Ophiucus larger shield-area coloured in blue. Additionally, the triangular “head” of Ophiucus could be envisioned as a helmet—and in the Pylos Combat Agate, it is the Spearman (in contrast to the Swordsman) who wears a helmet. The outline of Ophiucus portrayed here connects the stars at the top of Ophiucus into a triangle, but if a more curved line were to be envisioned, that triangle could become a “dome” or a semicircle instead of a triangle— sufficient for a helmet (and note, once again, that the goddess Athena is notable for being described and depicted as wearing a helmet in many instances, thus further indication that she, too, may correspond to the same constellation Ophiucus). In any case, it should be fairly obvious when looking at the constellation Ophiucus that it could be envisioned as a rather heavily-armoured combat figure, with only the legs protruding from beneath the well-protected body—and that is precisely what we see in the case of the Spearman on the Pylos Agate. 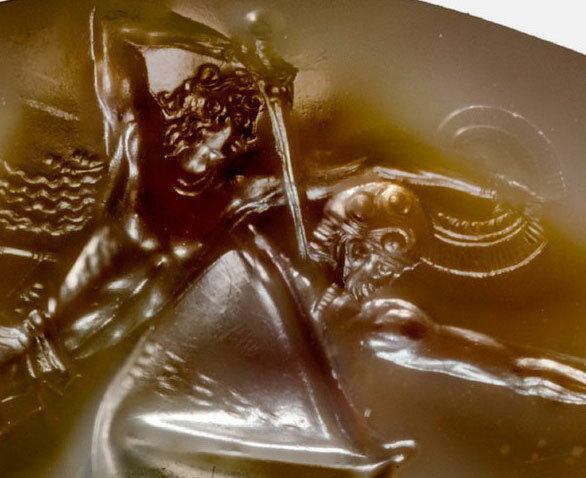 The confirmatory detail indicating that we are indeed looking at a celestial scene involving Hercules and Ophiucus in the Pylos Combat Agate is found in the extended arm of the Swordsman, which is grasping the distinctive, curving helmet-crest of the Spearman. The ancient artist of the Pylos Agate has depicted this crest as a sort of open “C-shape,” with the opening pointing upwards. This detail in the Pylos Agate can be seen to correspond to the constellation of Corona Borealis, the “Northern Crown” in the night sky. Figure 07: Detail from Pylos Agate, showing Swordsman grasping crest. Figure 08: Outline of Hercules with added line imagining him grasping the Northern Crown. This detail, in addition to the general outline of the Swordsman’s body posture, confirms that the Swordsman corresponds to the figure of the constellation Hercules in the night sky. 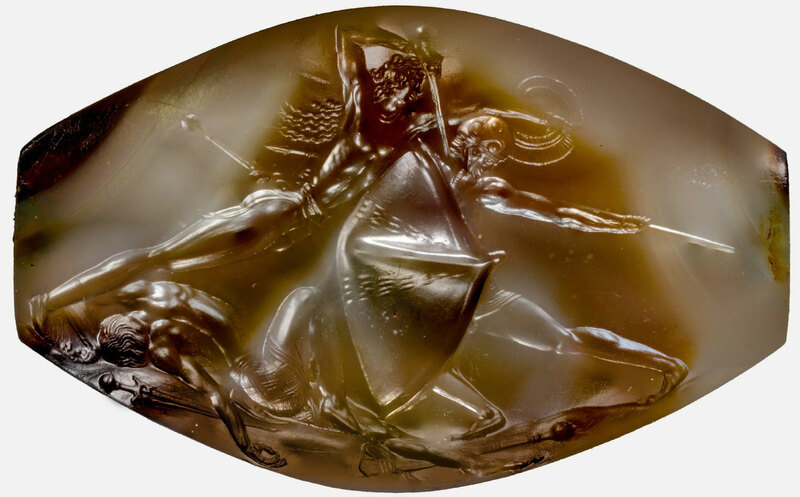 This detail jumped out at me the moment that I first saw images of the artwork on the Pylos Combat Agate, because I have found numerous myths from around the world in which a Hercules figure grasps a Northern Crown-type figure. I also explore these connections in books published well before the Pylos Agate came to light. 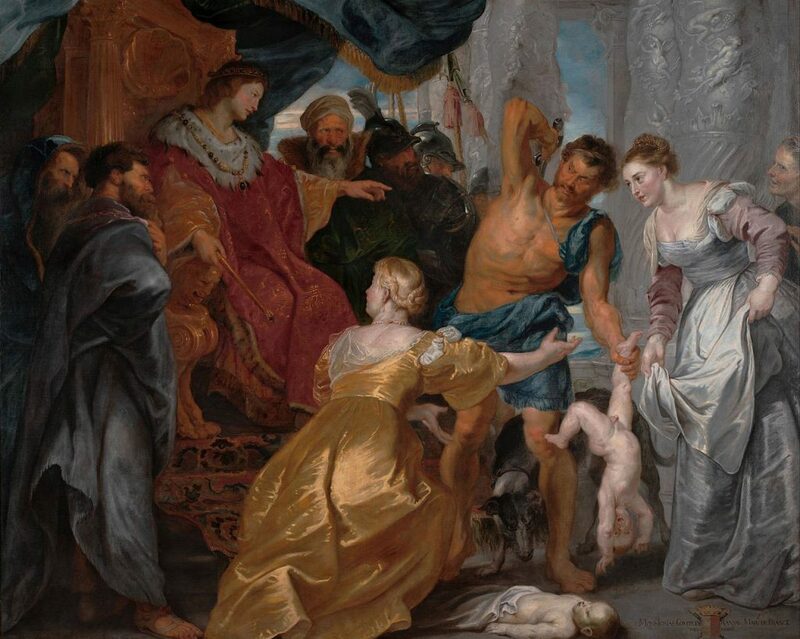 Figure 09: Judgment of Solomon, Peter Paul Rubens, 1600s. Wikimedia commons. In this seventeenth century painting, we see a powerful swordsman with a sword held over his back, grasping an infant by the heel. The infant is arching his body vigorously as infants do when they are upset, frightened, or angry. The swordsman in this case corresponds to the constellation Hercules, and the arching infant corresponds to the Northern Crown, or Corona Borealis, which (as we have seen) is close enough to Hercules in the night sky for us to imagine the constellation reaching out to grasp it. Other myths from around the world also feature a “Hercules figure” grasping an infant—notably the story of baby Maui from the Maui cycle of myths found across the cultures of the islands of the Pacific Ocean, from Hawai’i to Aotearoa (New Zealand). In the Maui stories, baby Maui is described as being thrown into the sea foam by his parents, who do not want him. The child is protected by seaweed and jellyfish so that he does not perish, until his mighty grandfather, Tama of the Sky, rescues the abandoned baby Maui and hangs him up in the rafters to dry above the fire. In this myth, Tama is again Hercules, and the baby is Corona Borealis (which is indeed located high up in the “rafters” of the sky, not far from the north celestial pole). The fire in this case corresponds to the smoky column of the Milky Way galaxy, which rises up towards Hercules and passes by his extended rear leg. Other myths and stories involving the grasping of Corona Borealis by Hercules, which have been discussed my blog posts and books published long before the Pylos Combat Agate artwork was revealed, include the “rapture” described in Revelation chapter 12, in which a child is “caught up” to God and his throne in verse 5. Another is the story that begins the entire cycle of tales in the Thousand Nights and a Night (also known as the Thousand and One Nights, or the Arabian Nights), in which Shah Zaman departs from his palace to visit his brother King Shahryar, but forgets a string of jewels, which Zaman had intended to bring with him as a gift. When Shah Zaman returns to get the necklace, he discovers his wife copulating with another man, and immediately draws his scimitar and cuts both his wife and her lover in half (cutting “the two into four pieces,” as the text says). Once again, a figure that is reaching for a string of jewels while swinging a mighty sword can be seen to correspond to Hercules and the shining arc of the Northern Crown. This is discussed in my October 2014 blog posts (in this case with the Northern Crown playing the string of jewels). 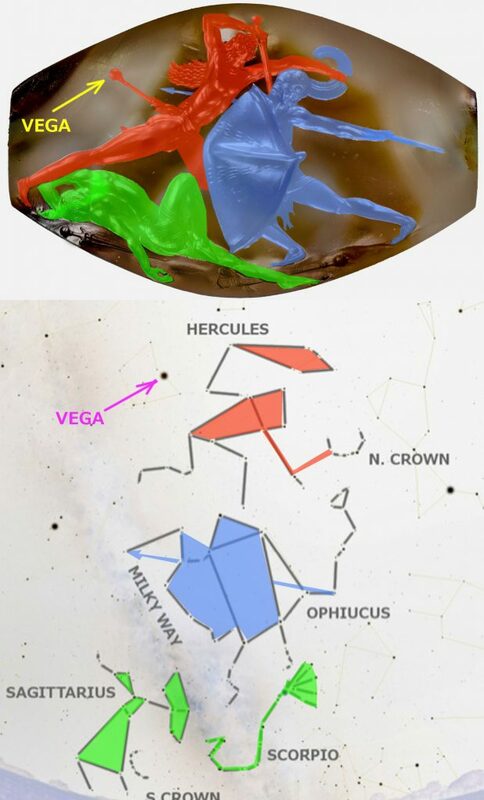 Figure 10: Pylos artwork and star chart indicating location of Vega. Other figures in the Pylos Agate display similar correspondences to constellations, as well as to artwork found in cultures around the world. As explained, the Spearman clearly corresponds to the outline of the constellation Ophiucus in the night sky. Ophiucus is located immediately below Hercules in the heavens; thus, in some mythical episodes, he corresponds to a figure who is slain by a Hercules figure (although in other myths Ophiucus corresponds to a descendent of a Hercules figure, which is also understandable and revealing of another intriguing angle of this ancient world-wide system of patterning myths on the stars). In my 2016 book, Star Myths of the World, Volume Three (Star Myths of the Bible), I provide an extended discussion arguing that the giant Goliath, slain by David with his sling, corresponds to the towering figure of Ophiucus in the night sky. There are numerous details in the description of Goliath in the scriptural text (specifically in 1 Samuel chapter 17) that reveal Goliath’s correspondence to Ophiucus, including the description of his armour. Note that the Spearman in the Pylos Agate scene is also heavily-armoured, and that (like Goliath) he carries a spear as his chosen weapon, consistent with other Ophiucus figures in mythology. 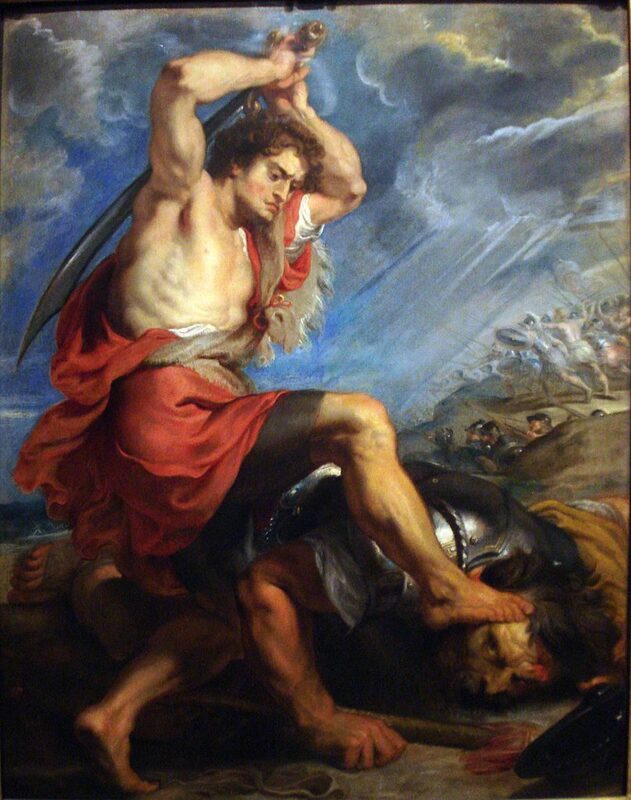 Figure 11: David slaying Goliath, Peter Paul Rubens, 1616. Wikimedia commons. Note that David, in this Peter Paul Rubens painting, has placed one foot on the side of Goliath’s head—a detail which can be seen to correspond to the outlines of Hercules and Ophiucus in the heavens (see the lower foot of Hercules in the constellation diagrams above). This correspondence shows that the identification of the Swordsman and the Spearman in the Pylos Combat Agate scene with the constellations Hercules and Ophiucus (respectively) is well-founded, and that it also aligns closely with sacred stories from other cultures (as well as with artistic conventions which appear to have continued to be employed for thousands of years after the Griffin Warrior was laid to rest in his tomb). 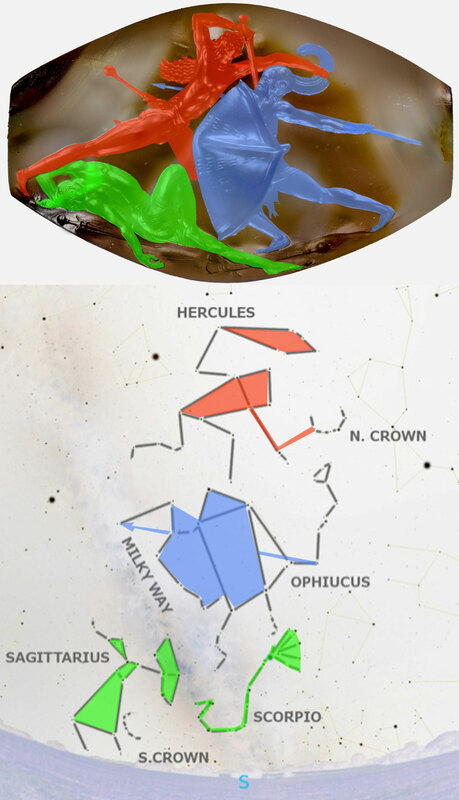 Finally, the outline of the third figure in the Pylos Agate artwork, whom I refer to as the Fallen Warrior in the scene, can be seen to be depicted with details that correspond to the features of Scorpio and Sagittarius in the heavens, both of which are constellations located beneath both Ophiucus and Hercules in the night sky. Figure 12: Artemis and Actaeon corresponding to Sagittarius and Scorpio, from the Bell-Krater of the Pan Painter, early 6th century BC. The correspondences between the figures of Artemis and Actaeon from the ancient artwork and the figures of Sagittarius and Scorpio in the heavens should be obvious. Additionally, the arrangement of the arms of the Fallen Warrior in the artwork on the Pylos Combat Agate show that the ancient artist (or artists) was using artistic conventions for figures associated with this region of the sky in other artwork from other eras, depicting sacred stories from other cultures. 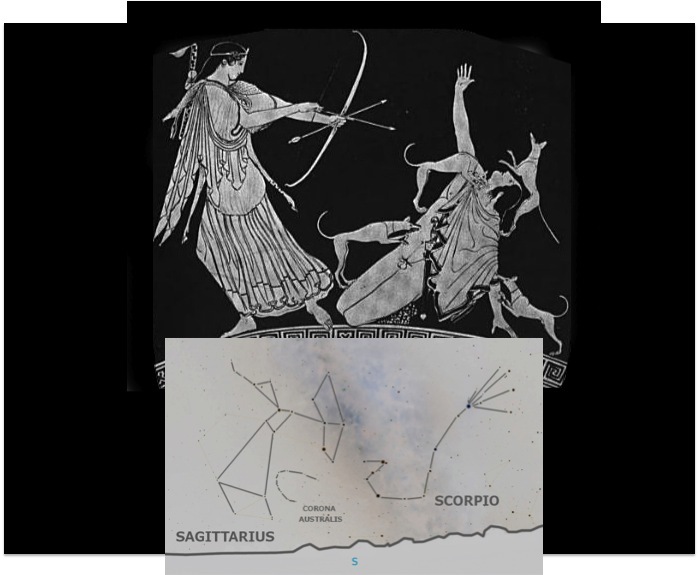 Specifically, I have previously argued that the convention of draping a hand over the head corresponds to the constellation Sagittarius, and that it has to do with the “plume” or line of stars that we can see rising up on the left side of the outline of the head of Sagittarius in the above image (and in the star-charts included in the illustrations). 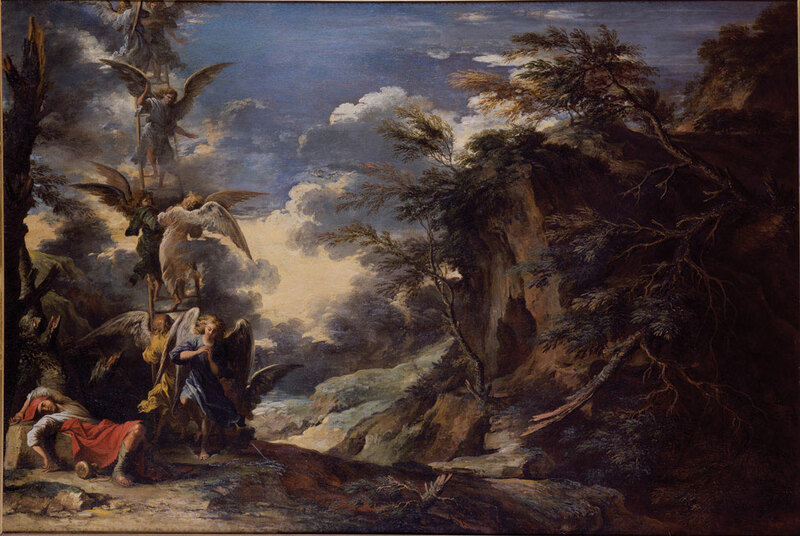 Figure 13: Jacob’s Dream, Salvator Rosa, 1665. Wikimedia commons. Note the configuration of the arms of the figure of Jacob as depicted by artist Salvatore Rosa (1615 – 1673) and compare them to the positioning of the arms of the Fallen Warrior in the scene from the Pylos Combat Agate from 1500 BC (or earlier). The correspondence could not be more compelling! In Star Myths of the World (2016), I spend some time discussing the celestial details in the Salvator Rosa painting, and in other depictions of the Genesis 28 episode of “Jacob’s Ladder.” Rosa has clearly envisioned Jacob as corresponding to the position of Sagittarius in the night sky, and the ladder stretching to heaven is of course the shining band of the Milky Way galaxy, which rises up between Sagittarius and Scorpio. The brightest and widest part of the Milky Way is found just above the point where it passes between Sagittarius and Scorpio—this brightest, widest portion corresponds to the Galactic Core—and you can see that Salvatore Rosa has painted the clouds in a manner suggestive of that very portion of the Milky Way. The angels which the scriptural text describes as ascending and descending upon the ladder in Jacob’s Vision almost certainly correspond to the winged figures of the constellations Aquila and Cygnus, the two great birds of the Milky Way galaxy, one of which can be seen to be flying upwards (or ascending) in the Milky Way band, and the other flying downwards (descending). This detail, as well as others in that text, confirm that the sleeping Jacob corresponds to either Sagittarius or Scorpio (or perhaps a combination of the two). 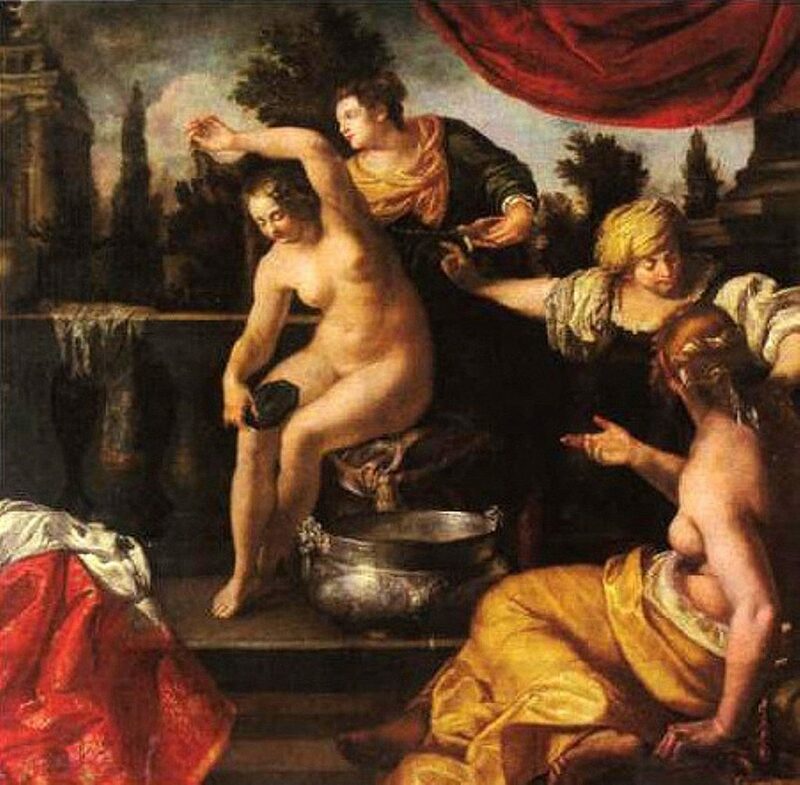 Figure 14: Bathsheba at her Bath, Artemisia Gentileschi, 1600s. Wikimedia commons. This is another painting that I discuss at some length in Star Myths of the Bible (see for example pages 156 – 157 and 530 – 535). 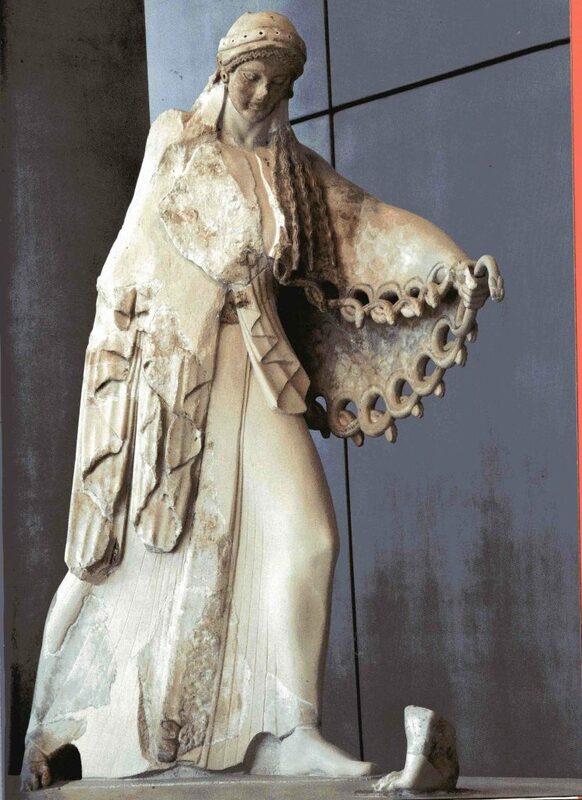 In that analysis, I argue that Bathsheba almost certainly corresponds to the constellation Sagittarius in the night sky, and that the positioning of her arms once again corresponds to the positioning of the arms found in the artwork on the Pylos Combat Agate for the figure of the Fallen Warrior. It is certainly remarkable that this artistic convention appears to be in use in artwork conceived before 1500 BC and in the 1600s AD (and later)! Taken together, they form compelling evidence for the existence of a worldwide system of celestial metaphor which informs ancient myth and ancient artwork in cultures literally around the globe and across vast gulfs of time. The fact that the Pylos Combat Agate was not even unearthed until after I had written about these correspondences makes it a conclusive piece of evidence for the widespread operation of this system in antiquity. 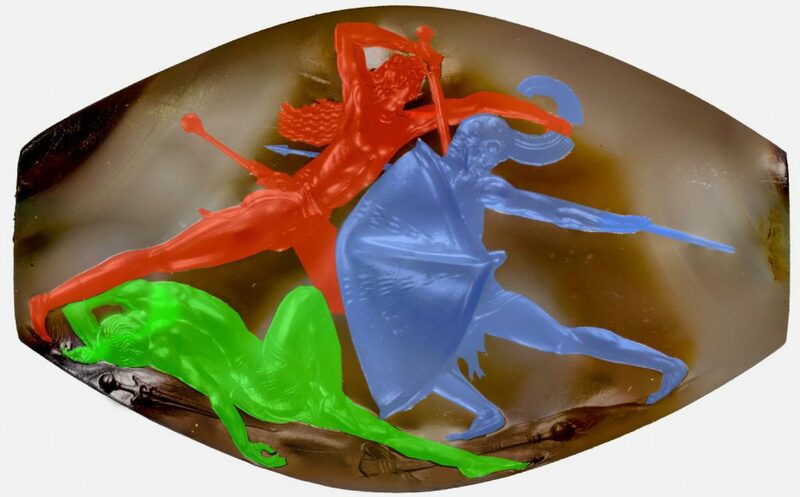 Added to the fact that it is such an early piece of artwork, and such a technically and artistically sophisticated artefact, the Pylos Combat Agate becomes a paradigm-shifting discovery. Added to the other astonishing aspects of the artifact, including its level of technical, artistic, and aesthetic sophistication, its great antiquity, and its tiny size—all of which are causing even conventional scholars to declare that this artefact upends many aspects of the accepted framework of ancient human history— is the clear correspondence of the characters depicted in the artwork to figures in the celestial sphere, dwelling among the infinite realm of the stars, using conventions that can be shown to belong to some world-wide system of myth and sacred iconography. This presents grave problems for the conventional historical paradigm. It thus takes its place among a now-overwhelming pile of other evidence from both archaeology and mythology, all of which points towards some now-forgotten culture or civilisation of great sophistication in humanity’s ancient past, predating all of those known to academia or admitted by conventional scholars. Beazley, John D. Attic Red-figure Vases in American Museums. Cambridge: Harvard UP, 1918. This drawing is found on page 113 of that text. All other images from Wikimedia Commons. Star charts created by the author using the free open-source planetarium app, Stellarium. Constellation outlines are based on those suggested in H. A. Rey, The Stars: A New Way to See Them. Boston: Houghton Mifflin, 1952. Enlarged World-wide edition, 1988. Rey expresses his frustration with the ornate outlines of previous centuries, as well as the abstract geometric outlines of the twentieth century, on pages 11 – 16. Intriguingly, Rey’s suggested outlines demonstrate amazing correspondence to the artwork from ancient sources and provide invaluable insight into the celestial foundation of ancient myth. Rey does not, however, appear to have ever mentioned this connection in his writings. i Richardson, Rachel. “Unearthing a masterpiece: A University of Cincinnati team’s stunning discovery of a rare Minoan sealstone in the trasure-laden tomb of a Bronze Age Greek warrior promises to rewrite the history of ancient Greek art.” UC Magazine. November 6, 2017.
ii De Santillana, Giorgio and Hertha von Dechend. Hamlet’s Mill: An Essay on Myth and the Frame of Time. Boston: Godine, 1969. First paperback ed. 1977, p. 4.
iii Richardson, Rachel, “Unearthing a masterpiece: University of Cincinnati team’s stunning discovery of a rare Minoan stone in the treasure-laden tomb of a Bronze Age Greek warrior promises to rewrite the history of ancient Greek art”. v Knapton, Sarah. “History of art rewritten as archaeologists unearth 3,500-year-old carving of ancient Greek battle.” Telegraph, November 8, 2017.
vi Marchant, Jo. “This 3,500-Year-Old Greek Tomb Upended What We Thought We Knew About the Roots of Western Civilization.” Smithsonian Magazine, January 2017. Have they recovered any DNA from the tomb? Even based on this posting alone I don’t see how the various images and stories you present are all-that-related to one another. For example they present different sword-wielding characters, in different contexts, with different sorts of swords, aiming at different targets, in different poses. Further, constellation-guide.com implies that the Hercules constellation is wielding a club, not a sword. My understanding is that we don’t know that the culture that made this carving accepted the same constellations that the hypothesis would require them to have accepted. Finally the connections you make essentially would require us to see any sword-wielding figure, in any culture’s imagery, as being part of the same tradition. Wouldn’t establishing that require a lot more? At the end of the day it seems most-likely that the ancient cultures, just like us today, thought swords and swordsmen were wicked cool and liked to tell stories about them, draw pictures of them, and see them in the stars. I’ve been attempting to reply several times over past few days to these questions / objections but it appears my replies are not showing up for whatever reason. Will try again here using a different browser application and see if that makes any difference. Your questions and objections are good and logical, especially if you are not familiar with the overall scope of my work and the broad outline of the thesis and supporting evidence I’ve been writing about in my past several books and on my website, blog, and accompanying videos. Very broadly, these constellations and their distinctive features appear in different myths around the world as different gods, goddesses, spiritual beings, human characters, monsters, etc, and take different forms, but the distinctive features of a particular constellation can often be recognized. 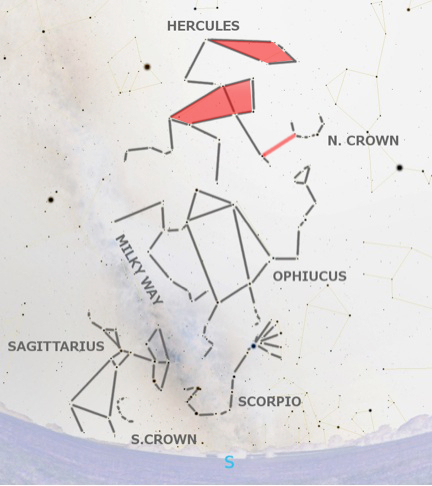 Thus, the constellation Scorpio will appear as a scorpion, a serpent, a multi-headed dragon, other multi-headed beasts (including the Hydra which appears in the Twelve Labors of Heracles / Hercules), and in many other guises, but can be recognized by other clues in the text or storyline (sometimes involving details which situate it in the Milky Way, since Scorpio is located at the widest and brightest portion of the Milky Way, near the Galactic Core). Similarly, the outline of Virgo has a distinctive “outstretched arm” and this will feature in many myths, but will show up in different ways (often, but not always as an outstretched arm: sometimes this part of the constellation becomes a stick or a pestle, etc). To be clear, I am not saying that these figures from other myths are based on the mythical character of Hercules (Heracles) out of Greece (or Rome) — they are based on the constellation Hercules in the sky, which is interpreted as carrying a powerful weapon, sometimes a club, sometimes a sword, sometimes a mace, sometimes a thunderbolt, etc. But your objection that my approach requires “any sword-wielding figure” to be associated with this constellation is a good point — and one that I basically address in my analysis. When a figure is holding a sword OVER ITS HEAD in the exact same posture as the Hercules constellation, that is just one clue or data point: we need to look for others. Other distinctive characteristics of the Hercules constellation include a dramatically extended rear leg (addressed in my analysis and present on the artwork), as well as the act of grasping an arc-shaped feature (corresponding to Corona Borealis, located directly in front of the constellation Hercules in the sky), and WE FIND JUST SUCH A GRASPING OF AN ARC in the ancient Pylos Agate! Did you miss that part of my analysis? That is what I point to as being the conclusive additional clue which confirms that we are dealing with a Hercules figure here! 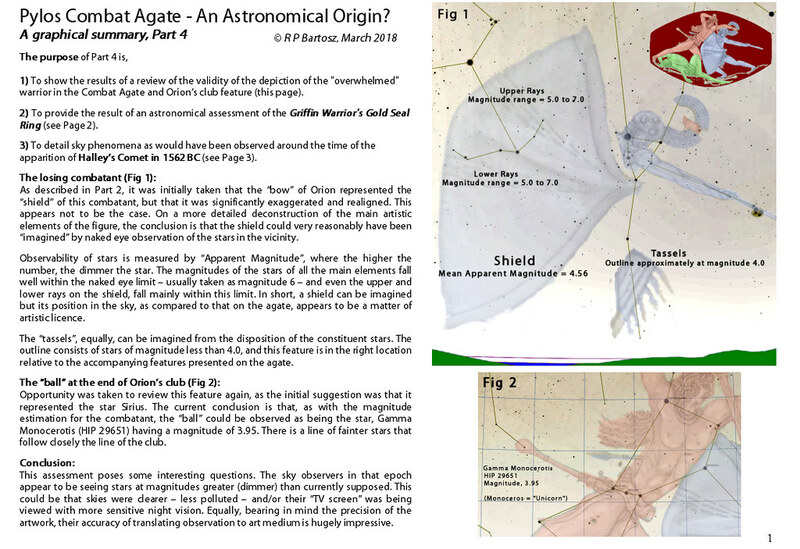 In addition, we have yet another additional confirmatory detail in the globular end of the scabbard, which corresponds precisely to the location of the bright star Vega, also located close to Hercules in the sky, at the same point as indicated in the artwork! So, you cannot object that I am just seeing a figure with a sword and then saying, “Aha, must be Hercules!” Your objection does not appear to take into account all the other evidence provided by the artwork and analyzed in my discussion. 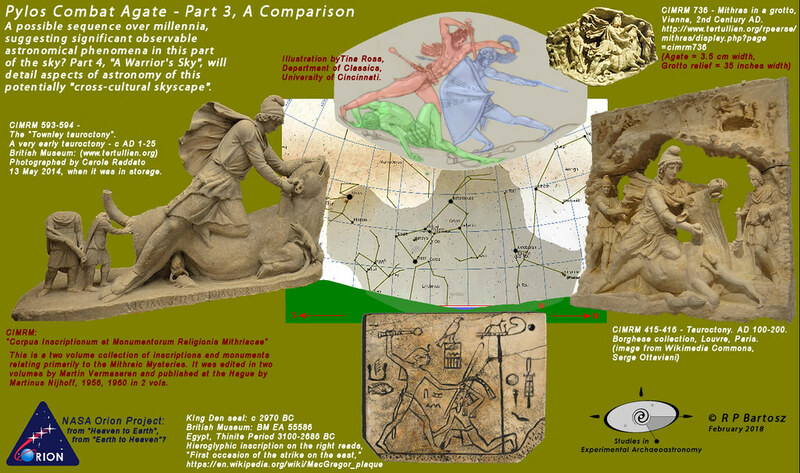 Now, moving on to some of the other constellational features, did you not see the images and discussion of correspondences shown between the later Greek vase depicting Artemis slaying Actaeon, and the distinctive features of the constellations Sagittarius and Scorpio? Do you believe that these correspondences are not conclusive? I don’t see you mentioning that evidence in your objections above. There are very specific constellational features present in the angle of the body of Artemis and the angle of the constellation Sagittarius, the length of the dress of Artemis and the outline of the “garment” formed by the stars of the constellation Sagittarius, the position of the feet of Artemis and the position of the feet of the constellation Sagittarius, the plume on the quiver carried by Artemis and the line of stars extending above the head of the constellation Sagittarius, etc. These are not minor points — the artwork is clearly based on the constellations — and what’s more, on the constellations as outlined by H. A. Rey (back to that point in a moment). Now, I had already seen these correspondences in the later Greek vase long before the Pylos Agate came to light — but intriguingly, the Pylos Agate uses some of the same constellational correspondences that are used in other artwork associated with Sagittarius and Scorpio, as I show in the article. Do you not see the arm over the head in a distinctive gesture portrayed in artwork of Sagittarius-figures (such as Bathsheba in the story of David and Bathsheba, and Jacob in the episode of “Jacob’s Ladder” or the dream at Beth-el)?? Those same distinctive Sagittarius features are present in the Slain Warrior in the Pylos Agate! And there are many other distinctive correspondences which are found in artwork from other cultures, as discussed in the article. Now to your objection that different cultures envision the stars differently (ie, have “different constellations”). This is another good objection — and it is in fact true! Different cultures DO have different constellations — which makes this evidence all the more astonishing, because it can be shown that cultures around the world (even if they themselves have “different constellations” of their own) appear to be using myths that are based upon A COMMON WORLD-WIDE SYSTEM that was already in use in ancient Egypt and ancient Mesopotamia (we can prove this from their artwork) and which envisions the constellations very much the way that H. A. Rey (most noted for creating, along with his wife Margret, the Curious George books, but also should be known for the system of constellation outlines he suggested in a 1954 book) envisioned them. In other words, these myths probably descend from A MUCH MORE ANCIENT SOURCE (predating ancient Egypt and ancient Sumer) which used the system that can be found in myths and artwork WORLD-WIDE, even in cultures which later developed their own different ways of looking at the constellations. I have published seven books showing these connections (especially Star Myths of the World, volumes One, Two, and Three, which have hundreds of illustrations each, and Volumes Two and Three have over 700 pages each), as well as over a thousand blog posts and dozens of videos: the evidence is overwhelming that the myths are using a common world-wide system. The points of correspondence are specific enough that it is extremely unlikely that these myths developed independently of one another — as you point out, different people can see different things in the same stars (different cultures do as well), so for there to be the level of very specific correspondences that we see cannot be convincingly explained by the argument that all these different cultures just independently “hit upon” the same rather obscure interpretations of the stars (such as seeing the arc of stars of Corona Borealis as an infant — this is not something we would expect many different cultures to “hit upon” independently of one another, and yet we see Corona Borealis being envisioned as an arching infant in the story of Solomon in the Old Testament, in the book of Revelation in the New Testament, in one of the Maui myths in the cultures of the Pacific Ocean, even in the story of Achilles being dipped in the River Styx, or burned in a magic fire, depending on the version of the Achilles story). In short, these are astonishing claims that I am making — but they are backed up by overwhelming amounts of evidence from myths around the world, as well as artwork from around the world, some of it extremely ancient. The amount of evidence is not only compelling — I believe it is conclusive. If the evidence that I’ve offered in this article is not enough to establish the argument, I’ve provided hundreds more examples in my website, videos, blog, and books. This thesis is not based on pure speculation that is not supported by overwhelming evidence. And when a new find like the Pylos Agate pops up and it is using the same system, the case becomes even more compelling. thanks for your questions — hope those explanations will help. Regarding DNA in the tomb: I found only one reference with a quick search, which states that tests are pending. The tomb is really, really old so I wouldn’t be surprised if they didn’t get enough DNA material to tell all-that-much. My understanding is that there ain’t much DNA on bones. I also have no idea how much we can actually learn from these kinds of tests, especially on an Ancient person. But I guess we shall see. Thank you for bringing this up, I find it fascinating. The ancient Serpent held all of creation on her back. She is depicted in the House of Sokar, the 5th hour of the Duat (G.P. five tuned relieving stones over the main chamber). The glyohs of this show Isis as the face atop the pyramid within which the 5 house is held, birds above, over a helm, an enclosed helm. The star myths of ancient times are the great myths and wisdom of incredible antiquity which the human condition comes to know from time to time. It is possible that this wisdom is part of the legacy of the star spanning culture which seeded humanity to the Earth long ago. (See “The Mystery of the Crystal Skulls” ” Ceri Louise Thomas and Tom Morton.) . . .
Time turns the wheels, the forces come onto play, and he who is not prepared in wisdom and perhaps even guile will find his way harder than it would be, and perhaps his delivery from the recurring problems hidden from his view? interesting article however any connection to the constellations of Hercules and Ophiuchus is rather slim from a mythological stand point based on what we know about Hercules. First of all Hercules is represented in antiquity through myth and art with short hair and beard wearing a lion skin waging a wooden club, while in the agate we clearly see a long haired warrior yielding a sword. Second there is no myth or legend about Hercules fighting any serpent bearer (Ophiuchus) in any text. Additionally your connection to Ophiuchus and Athena does not make sense. Athena was sent by Zeus to guide and protect Hercules. It does not make sense that the ancient artist who made the Agate would make such an error in having two warriors, Hercules and Ophiuchus-Athena, fighting. This would go against any myth and nobody would have commissioned such an object of art. I understand your objections but you are missing the wider scope of the thesis which I am asserting: the constellation we know as Hercules does not “belong” to the Greeks, and does not only show up in myth in the form of a muscular bearded hero with a club. The same constellation manifests as Hanuman in the Vedas and Sanskrit epics of ancient India, and as the swordsman in the story of the Judgment of Solomon in the book of 1 Kings in Hebrew Scripture, as well as in the figure of David (who plays a lyre — note the constellation Lyra right next to Hercules in the sky) and in the figure of Thor in the Norse myths, and even as female figures in some myths. Secondly . . .
Also, when Heracles absconds with tripod from Temple at Delphi, Ophiuchus plays the role of the tripod. This scene also appears quite often in ancient Greek pottery. Apollo, who chases Heracles, corresponds to Sagittarius in that episode. There are many other examples which could be offered. The concept is fine, but the methodology leaves a lot to be desired. 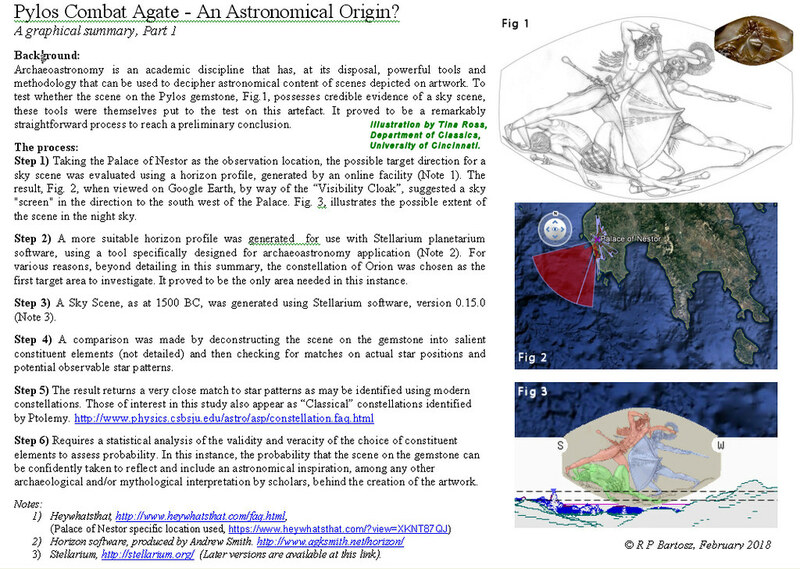 You’ll find a more scientifically based assessment at academia.edu, titled “Pylos Combat Agate-An Astronomical Origin?”(if you are a member there), in two parts (third to come). It’s a graphical summary – just to keep things as easy to read as possible at this stage. Once you know exactly which part of the sky is a credible subject area, then you can start speculating on why it was important enough to have etched into such a small item, in such detail. The third part titled, “Pylos Combat Agate – A Warrior’s Sky”, will look at further astronomical parameters. Only once you have a credible “celestial battlefield” to focus onto, can you start bringing in the mythological evidence – if there is any. The problem, at this stage, is that archaeology dismisses such possibilities, as a matter of “default” positioning, i.e. it’s at the bottom of the list for consideration, even when the celestial evidence is staring you in the face, and the terrestrial interpretations are floundering! The obvious part of the sky for the swordsman is the constellation of Perseus, Mycenaea’s mythical founder. Otherwise, this scene may well be Pollux slaying Lynceus who with his spear has just mortally wounded Castor. As the protectors of sailors, Castor & his half brother would be worthy of being depicted on the royal seal of a maritime power. Evidently they were important enough to overlook the fact that they weren’t each other’s twins, but only half-brothers, and to thereby change how Gemini was described – originally a man & a woman as in Magian star lore. Did you read the entire article? Your assertions are not based on the evidence. The seal was found at Pylos, not Mycenae. The artistry is thought to be Minoan, not Mycenaean. The body posture of the Swordsman parallels the outline of Hercules (the constellation), not the constellation Perseus. The Spearman beneath corresponds to Ophiuchus, which is below Hercules in the sky, not Perseus. The Swordsman grasps an arc — corresponding to Corona Borealis, which is close to Hercules, not Perseus. To top it off, the scabbard has a globe which indicates the location of Vega in relation to Hercules. It is of course good to investigate the possibility that a figure in art might correspond to this or that constellation, but then you have to look for additional clues in order to confirm the identification. This piece contains abundant clues. I have to disagree. It’s like an archaeologist, a thousand years from now, saying that a photograph of a woman found in a place, but without a title, saying it must be the Queen, if you get my gist! No, more likely an important member of someone’s family. This is about what part of the sky is important to the Griffin Warrior, and why he or his family wanted it to be placed in his grave – if it ruly represents a sky scene. It’s a very specific scene important to him. You are trying to impose what is known of Mycenean cultural history onto this warrior and his agate. A statistical analysis of sky features for your suggestion would have a very low probability. Mythology, which can offer many different interpretations of warriors, swords, battles etcetera can lead you to many dead ends, IF you don’t have a credible scientific interpretation of the place in the sky represented on the agate FIRST. Capitals I’ve used here merely emphasise the priorities in the process of investigation – not any “emotive” response to your comment. This is what interdisciplinary cooperation involves – one disciplne seeking comment from another discipline who’s academic area of work involves the sky, and which can help interpret such specific scenes before bringing in the mythological and/or other considerations. If you are a member of academia.edu, then please look at my first two parts that I’ve uploaded there. The third, with more detailed astronomical considerations is still in the process of preparation. Apologies “ruly” should read “truly”. Just a typo! holding them by the hair in one hand while holding a club high above their heads…..
Video quality is not the best but if you watch beginning at about 22 and continue on for a minute or two, you will see the seal with King Den and then the corresponding image of Orion and Eridanus. Note that the posture of the pharaoh is more upright than that of Hercules, and the posture of the victim corresponds to Eridanus, not to Ophiuchus and Corona Borealis as in the Pylos Agate. i) Unfortunately, you use the current configuration of the sky – 2018. 1500 BC was very different. Hercules was an entirely northern sky figure not south. In short the sequence you show could only have been seen lying down on the ground, and no imagery should/would contain a “ground” on which the characters in the agate are clearly on! It is difficult to suggest that the lengths taken to produce the incredible detail on the agate, would have been based on an entirely impossible matching scene in the sky itself. ii) All the Greek evidence you provide is Odyssey and later, written 8th century BC, and even Troy itself can’t be taken back to earlier than around 1300 BC. The agate is c 1500 BC. You are extrapolating back areas of sky, stitched together from various stories to try and fit into the agate scene. Even the Artemis/Scorpio image, although it appears entirely credible as a sky scene, is a different era – and further more Artemis was connected, in several stories, as the hunting companion of Orion, not Hercules. iii) Your biblical references and imagery is even further detached from the agate dating, and is an entirely different set of stories. It is more connected with the spiritual/consciousness side of your presentation, which is pure speculation, and therefore can’t be taken as evidence, in terms of extrapolating back to the Griffin Warrior. iv) As regards the Scorpio feature to the bottom right of the “shield”, it is astronomically an “asterism” made up from, at least, the stars of 38, 1, 2, 4, and 5 Tau. As Part of my preparation for Part-4, I actually reviewed the “shield” depiction and can tell you precisely how it comes about astronomically. I might upload a separate image later, specifically to answer your suggestion in the youtube video. v) Although you have presented another particular item in the video you have not undertaken an astronomical assessment of it. I have, and it confirms the Orion/Taurus scene, as well as supporting the identification of a specific sky phenomenon. This was to be a part of Part-4, but I may introduce a furthe part in my academia.edu uploads, to make the issue even clearer. Having said that, I have no argument, at all, with the matter of celestial metaphor. I can see that you are keen, and rightfully so, to try and defend your interpretation, but you have in my opinion been somewhat too hasty to do so. It’s unfortunately a situation, where you have forgotten to leave room to wriggle out of, if you get things wrong. However passionate you are about the celestial metaphor approach, you do have to leave room for not being right on every occasion that an spectacular new item, such as the agate, materialises. Being first to present an interpretation, such as this one, is a courageous thing to do, but this has to be supported with evidence of using archaeoastronomical skills and methods, and consultation with scholars in that field. Otherwise you both open yourself up to criticism, and at worst, perpetuate the resistance shown by academic disciplines, such as archaeology. Graham Hancock, himself, can tell you a thing or two about that! This is why my approach, at academia.edu, is the first stage leading to a consultation stage – where archaeologists will be invited to comment – following which a final publication will follow. “This is a temporary upload while continuing with the preparation of Part-4 – there is quite a lot of astronomical detail to fit into an illustrative graphic, some of which is causing problems. 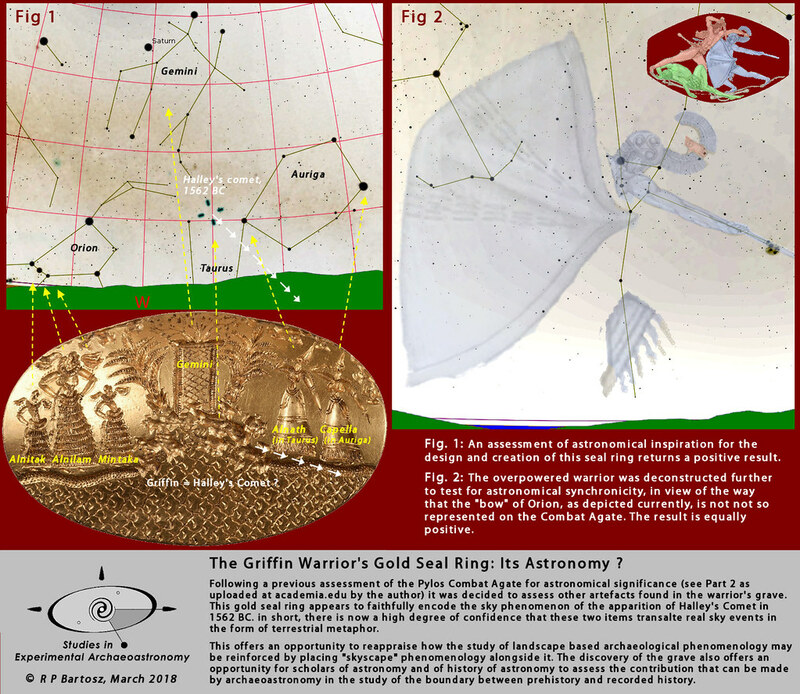 The purpose of this upload is firstly, to show the results of a review of the validity of the depiction of the “overwhelmed” warrior in the Combat Agate, and secondly, to provide the result of an astronomical assessment of the Griffin Warrior’s gold seal ring. The result of the second item, is as stunning as that of the agate. In short it offers a credible conclusion that the “griffin” is in fact a depiction of the apparition of Halley’s Comet. The best fit occurrence appears to be that of the apparition as at 1562 BC – as calculated by algorithms in Stellarium (Version 0.17.0). This, of course, only determines that these two items can be provisionally dated to around this epoch. It does not confirm anything about the the warrior himself, since these items may have been inherited as a family heirloom, before his birth, or acquired at anytime during his lifespan. It does not confirm, in any way, that these items were commissioned by the warrior, either himself, his family, or as a reward of some kind in recognition of his important place in society at that time. Perhaps more importantly, if accepted after appropriate academic scrutiny, the items represent evidence for academia to reappraise the contribution that archaeoastronomy can make to the study of landscape based archaeological phenomenology. If the gold seal ring faithfully encodes the sky phenomenon of the apparition of Halley’s Comet in 1562, then there is an equally important “skyscape” phenomenology to consider, whereby celestial events are accurately depicted as terrestrial metaphor in artwork. It is an aspect which fits into current initiatives such as the “Journal of Skyscape Archaeology”.(https://journals.equinoxpub.com/index.php/JSA). thanks for your comments — however, I believe your “too hasty” criticism is incorrect. Prior to the public release of images of the Pylos Combat Agate, I had already published six books detailing evidence of a worldwide system in operation in the world’s myths. I am not trying to “stitch together” various stories to “try and fit” the agate scene — the agate scene is another example confirming things I have published in illustrations going back to 2011 . . .
please go have a look at my books Astrotheology for Life (318 pages and over 70 illustrations), Star Myths of the World Volume One (482 pages and 111 illustrations), Star Myths of the World Volume Two (718 pages and 255 illustrations), Star Myths of the World Volume Three (766 pages and 277 illustrations), as well as the dozens of videos linked on my website . . .
the evidence is quite clear that this system came from some culture PREDATING ancient Egypt, ancient Mesopotamia, ancient China, ancient India, and the ancient Indus-Saraswati civilization. So, where on the globe it came from is presently not able to be stated in a dogmatic fashion (but it predates this artifact) . . . I would suggest we don’t know WHAT culture or civilization it came from, but we DO know that the source culture was exceedingly ancient (art at Gobekli Tepe suggests they may have used this same system in some form), and was likely wiped out by a catastrophe of some sort (either a comet strike, as Graham has proposed and supported with evidence, or an electromagnetic discharge of great intensity, as Robert Schoch has proposed and supported with evidence, or perhaps some other catastrophe). When you say “Artemis was connected, in several stories, as the hunting companion of Orion, not Hercules,” you demonstrate that you have not grasped a point which I tried to clarify further in the video: you must understand the distinction between the CONSTELLATION that we today call “Hercules” and the mythical figures THROUGHOUT VARIOUS CULTURES who are associated with this constellation (one of whom being the Greek figure of Heracles, or Hercules to the Latins) . . . The constellation is not exclusively linked to that ONE CULTURAL MANIFESTATION (Heracles). I understand that you believe you see Orion references in the images — that’s fine, but the abundance of evidence (as well as similar patterns found in numerous other myths and cultures, such as those mentioned and shown in the video and the article) appears quite conclusive that we are dealing with a representation of the region of the sky which contains the constellations Hercules, Ophiuchus, Scorpio, and Sagittarius . . .
Not necessarily the mythical character of Heracles — the constellation of Hercules. This constellation also appears as Bhima in the Mahabharata . . .
Archaeoastronomy has been dealing with astronomy and archaeology for decades, long before you – or Graham Hancock for that matter – published your books. I have been an amateur astronomer for the best part of my life. 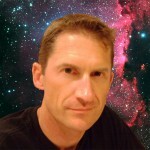 I have studied archaeoastronomy more specifically since 2006 or so – many aspects of the discipline before that in my working life as a landscape professional, which included dealing with issue such as light pollution and the need to protect areas of dark skies. Archaeoastronomy is also a truly multi-disciplinary, discipline. Representation of the sky in artwork is clearly not a new subject, so I, and others interested in this area of study will not disagree with your basic theme/s. However, the agate is a very specific artefact. You have been quite clearly arguing that it is based on Hercules, plus other constellations, which stitch together and are the basis for the elements of the artwork on the agate. You clearly state above, “… I understand that you believe you see Orion references in the images…but the abundance of evidence… appears quite conclusive that we are dealing with a representation of the region of the sky which contains the constellations Hercules, Ophiuchus, Scorpio, and Sagittarius . . .”. Past archaeoastronomy, all the books that you have written, all the books that Graham Hancock has written, are all irrelevant. The only issue is the agate (and I’ve expanded it to the gold seal ring). It’s very specific and arguing “generalities”, with evidence drawn from selected sources across a variety of epochs will not answer the key question – what area of the sky is represented on the agate. Unless you can specifically answer that then everything else is pure speculation and academia will throw it away. This is why Jason Colavito slammed you, but – and for the first time – I intervened to actually support your basic approach of celestial metaphor, and commended you for at least having the courage to put your head above the parapet. “An Anonymous Nerd”, who commented here earlier, also commented at JC’s site. In reply to him you state “…it is using the same system…”, but nowhere, to date, do you venture to mention the constellations of Orion, Taurus, Lepus, Eridanus or even Gemini – as in my temporary image I gave the link to in my previous post. In short, your approach – selected mythology – has not even pointed you to the most likely specific area represented on the agate, and comes nowhere near answering the question in a way credible to archaeologists, yet alone astronomers, historians of astronomy and archaeoastronomers. The archaeoastronomy, as I have presented it, is consistent in pointing to the same part of the sky. It is from here that one has to take the analysis deeper and deeper. To illustrate this point, let me link you to the first page of my Part 4. So readers here get to see this before readers at academia.edu! I’m firing a shot across the bow. As someone who’s professional life involved reviewing scientific papers and presenting summaries for decision makers at the political level, take it from me, your methodology alone wouldn’t make the starting line for assessing a specific item such as the agate. But I’m a realist too – my approach is equally likely to fail to impress the hardened academics, resistant to any input, however credible, from outside academia. Such is life! Failure to achieve deserved credit is one thing, but failure because the argument is wrong is entirely another matter. I’m not going to continue this conversation anymore because I don’t have the time now, and I think that I’ve made my points perfectly clear. I commend you for your initial courage, but it takes as much courage to admit that perhaps there are areas of missing expertise that don’t support your initial interpretations. What you do about this is of course entirely up to you. a) I have no problem with honest criticism and debate, but feel no need to rebut criticisms that I’ve dealt with extensively elsewhere, especially if my suggestions to go look at what I’ve said elsewhere are ignored. b) my impression of your “friendly criticism” is that you are coming on here and presenting your pet interpretation without actually addressing any of the evidence that I actually presented, and without examining the many other parallel examples which support it. c) Evidence I’ve presented here and elsewhere shows that the world’s myths, from around the globe, share a common system. Your statement that all the material in the other books I’ve written is “irrelevant” reveals that you do not grasp that this is the argument (or else that you deliberately wish to distract attention from that central argument).
. . . as well as the god Hanuman in the Ramayana and other ancient Sanskrit texts, and Shango in the Yoruba tradition, and Shen Guang who becomes Dazu Huike in the Bodhidharma legends of China and Japan and Korea, as well as Tama-nui-te-ra who rescues baby Maui from the sea foam . . .
I’ve been very specific. Focus on the agate, and now the gold seal ring. What does your approach say about the latter in terms of specific sky location (rhetorical). What I see is a host of general arguments all pointing to the need to purchase your books, at great expense, to do little but argue in circles. The theme of celestial metaphor, shared around the globe is already accepted, I’ve stated that clearly, and my researches involved this before you published your books. I’ve pointed out that you have not used the investigative skills of other academic disciplines – that is my stand. The result is that you have specifically pointed people to Hercules +, as being the “message” in the agate. I don’t need to argue why not, as there is already counter argument from others. My message, using scientific tools and approaches points to a different scenario for the artefacts. People will read and make up their own minds I’m sure. No one has come back and challenged my conclusions, except for one poster who challenged yours here and both of us at JC’s site, but then without the detail of my investigation and a better understanding of where I was coming from. Now he has both to counter if he so wishes! a) if you had looked at my other writings before coming on here to tell me things like “archaeoastronomy has been dealing with astronomy and archaeology for decades, long before you” then you would know that I have addressed this fact in extensive detail in my prior writings and publications, including an entire chapter in my 2017 book Astrotheology for Life, as well as in many of my 1000+ blog posts. b) I don’t have any problem addressing criticism or disagreement, but it is very frustrating to have to deal with criticisms which I have already addressed in detail elsewhere, and which are clearly the product of someone who has not taken the time to even have a look at it. c) my impression of your “friendly criticism” is that you are coming on here and presenting your pet interpretation without actually addressing any of the evidence that I actually presented, and without examining the many other parallel examples which support it. d) while readily acknowledging that analysis of the obvious connection between myths and stars has been going on for centuries (back to the time of Plato, and doubtless before that — search my blog post for the words “Plato” or “Aristotle” or “Lucian,” for instance), I would also point out that even the authors of Hamlet’s Mill appear to have been unaware of the constellation-outlining system of HA Rey, first published in 1952. His outlining system opens up perspectives not available to the archaeoastronomers of the early 20th century, for example. Whether he was brilliant on his own or whether he was privy to some system passed down in closed circles for millennia, his outlining system matches artwork from ancient Greece, ancient Egypt, and around the globe — and is essential to this discussion. I have not seen his work incorporated in the work of others in this field previously. e) Thanks for your “shot across the bow,” but I’m well aware of the prejudices and paradigms of academe. I have taught in the department of English and Philosophy at the US Military Academy at West Point and have first-hand understanding of what academia in general will and will not consider or publish. There may be more going on there than mere “resistance to any input, however credible.” If you don’t think that the news media and academia are being deliberately obtuse on issues of recent history (including the assassination of leaders such as JFK and Martin Luther King, Jr. as well as the events of Sept 2001) then you should look at evidence again. They are almost certainly being just as deliberately obfuscating on matters of ancient history. Richard, if you are correct, that culture worldwide is based on constellations, then David’s work is important, and wider in scope than all the other piecemeal correspondence theories. However constellations are just one of the media of culture (myth, calendar, ritual, art, buildings, technology, language, iconography, etc). None of these are primary. The only worldwide ‘system’ is nature, including us, with our conscious arrogance. Nature and culture are expressions of archetype, which is known only by its expressions.